As we mentioned in the previous post, there’s increased evidence that proper sleep quality is enormously important for hormonal balance, immune system functioning, and proper functioning of the nervous system. While different people have different needs regarding the amount of sleep, the need for good sleep quality is a common denominator. Here’s a simple yet thoroughly enjoyable bedtime routine that will help you enhance the quality of your asleep hours. Set up the place to start your practice as close as possible to your bed. Beginning the practice by the bedside would be ideal: it will allow to easily climb in bed at he right time, straight off the mat. Rub a drop or two of lavender oil on the center of the plantar arches, and on your temples or behind the ears on the mastoid bone. Whatever is being left of the oil on your fingers, rub it onto the wrists. Get on the yoga/Pilates mat, on a folded blanket, or directly on the floor if it is carpeted and feels soft and welcoming. On hands and knees, with the legs about pelvis distance apart and the wrists in line with the shoulders, inhale arching the back, and exhale rounding the back. Narrow slightly the airways, and have the breath moving in and out with a light sound. Move slowly, arching the back with the inhale and rounding with the exhale. You may close the eyes if you wish. Do about 10 cycles, and stop in a neutral spine position. Still on hands and knees, walk the hands farther in front of you. Gradually the forehead and chest will lower as well. Make sure the hips remain over the knees, maintaining the thighbones perpendicular on the ground. Bring the brow down to the ground, with the arms outstretched forward. If you haven’t closed the eyes yet, you can close them now. Behind closed eyelids, gently draw the gaze toward the space between the eyebrows. This is Shambavi Mudra. Do not strain the eyes and feel free to release the mudra anytime you wish. Hold Downward-Facing Puppy for at least 5 breaths, or more if it feels comfortable. From Downward-Facing Puppy, slide on your belly.Bring the left cheek down on the floor, place the palms flat by the sides of your head with the arms resting on the floor and the elbows bend. Draw the right knee up toward the right armpit. Only draw the knee up as far as your pelvis remains aligned to the floor. Stretch the right leg, lowering it parallel to the left. Have your feet about pelvis distance apart. Bend both knees and keep the lower legs perpendicular to the floor; you can keep your legs steady or move extremely slow from side to side. 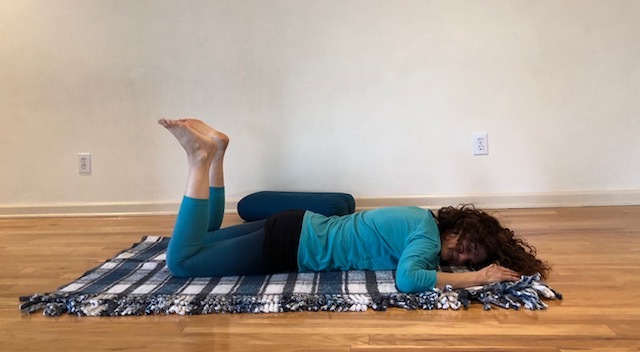 Lower the legs, bring the right cheek down on the floor, place the palms flat by the sides of your head with the arms resting on the floor and the elbows bend. Draw the left knee up toward the left armpit, the mirror position of what you’ve done on the other side. Only draw the knee up as far as your pelvis remains aligned to the floor. Stay with the lower legs perpendicular to the floor for about 5 breaths, either being still or moving extremely slow side to side. Lower the legs and slowly roll face up. Bend the knees, and place the feet on the floor, about pelvis distance apart. Slide the hips to the left, drop the knees to the right, and turn the head to the left. Keep the arms comfortable on the floor. 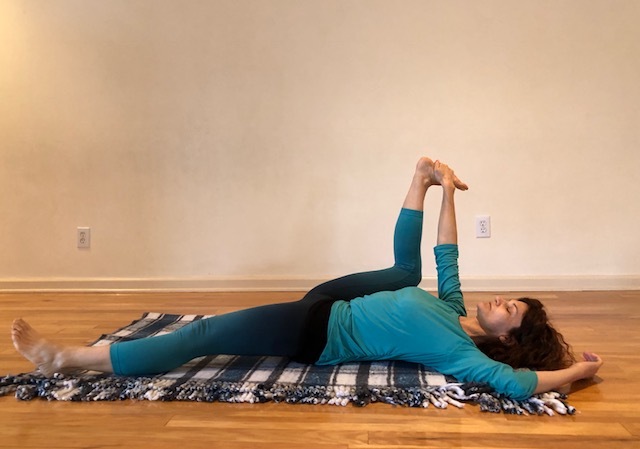 Expand the belly as you breathe in, hold the breath briefly at the top of the inhale, and relax the belly completely as you let the air come out. Do 5-7 cycles of abdominal breathing. If it doesn’t feel comfortable, just breathe slowly as you hold the twist. Bring the knees up to the center and realign your back. Set your feet wider apart, and drop the knees together at the center, leaning against each other. Place both hands on the lower belly, keep them by your side, or get the arms overhead if you prefer. Just be in this position for about 10 breaths. Then release and slowly turn face down. Bend the knees, and place the feet on the floor, about pelvis distance apart. Slide the hips to the right, drop the knees to the left, and turn the head to the right. Unwind the body and realign the back. With the feet on the floor and knees bend, draw the right thigh in, toward the chest. Hold the foot (if you cannot reach, use a strap or towel), guide the knee toward the floor with the sole of the right foot acing the ceiling. Slide the left foot on the floor farther and farther away: your left leg may get straight and flat on the floor, or not. Make it pleasantly stretchy and stay away from any kind of edge. Hold for about 5-7 breaths. Bring the knees up to the center and realign your back. Set your feet wider apart, and drop the knees together at the center, leaning against each other, same as before. Place both hands on the lower belly, keep them by your side, or get the arms overhead if you prefer. Just be in this position for few breaths, then release. With the feet on the floor and knees bend, draw the left thigh in, toward the chest. Hold the foot (if you cannot reach, use a strap or towel), guide the knee toward the floor with the sole of the right foot acing the ceiling. Slide the right foot on the floor farther and farther away: your right leg may get straight and flat on the floor, or not. Make it pleasantly stretchy and stay away from any kind of edge. Bring both feet on the floor, bending the knees. Draw the legs in: you can allow the knees to remain bend, with the feet hanging toward the rear end, or extend the legs up. Slowly bring the feet down to the floor and press up just enough to slide out the bolster. Get the feet close together with the inner edges touching, and drop the knees wide open. Stretch the arms out wide in a T, or rest the hands on the belly. When ready, gently roll over on one side, and then climb in bed. Lay on your back, cover the eyes with an eye-pillow, and take “snooze-asana”.